When you’re a job seeker and applying for roles and vacancies, you’ll already be well-aware of the fact that writing your resume is one of the most important parts. In most cases, it’s going to be your first impression with your potential new employer. 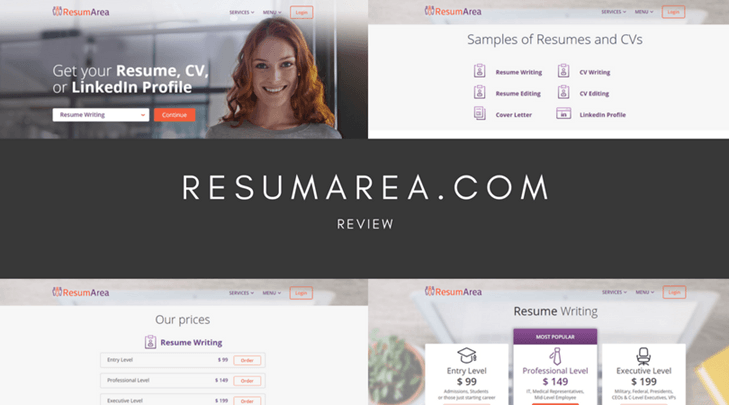 So, if you’re looking for a resume writing service that can create or edit your resume, so it’s perfect for securing that interview, you may have stumbled upon ResumArea, a resume creation website that claims to be the service you’re looking for. 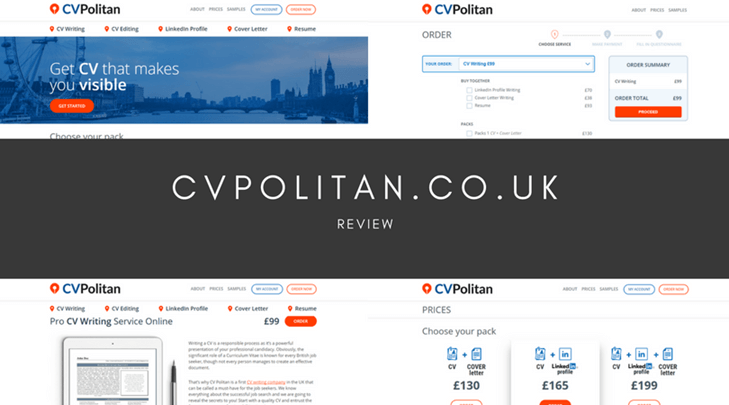 Simply by checking the drop-down menu on the homepage of the website, you’ll see that the site offers six main services which include resume writing and editing, CV writing and editing (for UK customers), cover letter writing and LinkedIn profile writing. While this may seem like a full of list of services, which it nearly is, there are still some key services missing, such as cover letter editing and document proofreading which you’d have to source elsewhere. There is a small slider in the middle of the homepage which has a collection of reviews on the service that this company provides. However, these are really basic reviews and don’t really go into detail about the service, nor have dates to prove the credibility of each review. Searching online on trust websites and forums, I found a tonne of mixed reviews where some customers say Resum Area was the best service they have ever used whereas other claimed the site was one of the worst thanks to typos in the content and even resales. Only about 40% of the total reviews were positive. ResumArea.com uses one of my least favourite payment systems where you fill out your details for your resume which then gets posted to a board of freelance writers who then bid for your work. This is such a crude way of doing things since most freelancers will keep their prices high and since you’re choosing the writer, there’s no credibility on the website if they do a poor job. Surprisingly, there are two ways you can contact the service should you need assistance. You can either use the live chat feature which is actually a ‘leave a message’ box so you can send a quick email to the company, or leave a message in their contact form on the contact page which is actually another order form. There are no email addresses, no dedicated pre and post sales support, no phone numbers, no live chat, no nothing, most likely letting their customers feel completely in the dark if they need help or assistance. As you can see, it’s really hit or miss with what kind of service you get from ResumArea. The pricing is high, the customer support is lacking, and the quality can be few and far in between. It’s not worth risking your money on what could be a poor experience, so my advice is to take your work to a more credible resume writing service. Writing a CV is never easy work, especially since you need write about yourself in such a way that impresses the person who reads it far more than any other CV that they read that day. Of course, not everybody is a comprehensive writer so may find this task a challenge, if not a little overwhelming. This is why services like CV Politan exist to take off the stress to handle your CV writing tasks for you, so you can focus on preparing yourself for your interview and applying for more jobs. But is this the right CV writing service for you, or do you need to take your business elsewhere? There are five key services that are offered by Cvpolitan.co.uk. These include CV Writing, CV Editing, LinkedIn Profile Writing, Cover Letters and Resumes (for international customers). While this covers all the basics, it’s worth noting that it doesn’t seem like there is a dedicated proofreading service which could be a key service that people are after. I was a bit surprised to see that there is no dedicated review or testimonials page to be found anywhere on the website, leading me to doubt the credibility and reputation of the website. This led me to search online for answers where I found mixed reviews on trust sites and forums. The average score was around 5/10, with some customers claiming that the service was ‘okay’ and did what they expected, while others complained about content that was delivered late, was full of errors and typos and wasn’t suitable for applying for a job. The pricing is rather strange compared to traditional CV writing services. Here, you choose the package that you want to pay for, such as CV + Cover Letter, CV + LinkedIn Profile or all three combined. This may cause problems if you simply want just a CV or just a cover letter since you’ll have to buy the package. However, all the prices are rather high. If you wanted all three services, it would cost you nearly £200. Even editing along is £77 which may be too much for a job seeker. You can find the contact page in the footer of the website. Here you’ll find a basic email form that you can fill out, and that’s it. There are no phone numbers, no social media links, no live chat service, no dedicated pre or post-sale email addresses or anything else, just the email form. This is a poor service since you can never be sure how long it’s going to take for you to get a reply from the company and it’s all done by email, which means you could miss a deadline if you need urgent assistance. All in all, CVPolitan has some major updates to do. Although the quality of the service can be hit or miss, the prices are far too high for each service, and the customer support simply isn’t there to call it viable. My advice is to take your CV to a more reputable, leading company. Writing a resume or CV from scratch isn’t the easiest thing in the world to do. Trying to find the perfect way to sell yourself and your skills without coming across as arrogant or unsuitable for the job you’re applying for is rather difficult once you begin. Fortunately, there is a ton of writing services available, such as Resume Help, who can help you complete this stressful task. ResumeHelp provides you with a very basic resume building service. This service is achieved by providing you with a resume template which can be selected based on your preferred role and the US state that you are from. After you have selected your chosen resume, you then customize your resume to suit your personal requirements. This allows you to create a resume in very little time as all the basics are already generated. Regarding trust, there are several aspects which put ResumeHelp.com in good stead. In the footer, you’ll find a linked Norton Security badge that provides the website with security features that protect your personal and financial information from users with malicious intent. There’s also a physical address so you can hold the website accountable. Unfortunately, there is no payment protection system, or proof of one, stating that their payment system is secure. It’s possible to use Resume Help for free. This includes all the features and services at no cost to you. Alternatively, there is a paid service which provides you with premium services, such as more detailed resumes and helps with the builder itself. A 14-day membership will cost $1.95, or there’s a monthly option priced at $7.95. There are no extra costs involved with these prices. The quality of the resume templates themselves is rather good. You can view every single template example before you set about building your own resume and each part is customisable, so if you don’t like a certain feature or it doesn’t apply to you, you can simply edit it. There are a handful of communication methods you can use to contact the company should you need to. On every page of the website, you’ll find a live chat feature that’s 24/7. There’s also an email (which has been described as having slightly long response times) and a phone number for instant assistance. Overall, the service has been described as good. 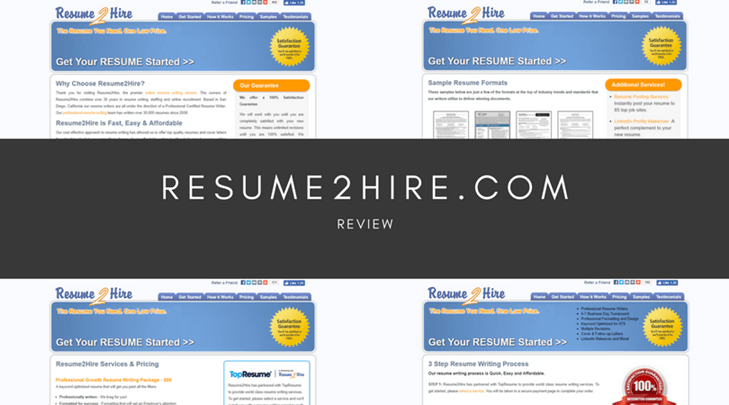 As far as a resume builder goes, Resume Help is a relatively adequate service, providing you with a range of comprehensive services in an easy to use format. However, not everybody has the time to go through a builder and may just require a complete writing service that does it on their behalf. If you’re looking for a service like this, you’ll need to take your business elsewhere. Writing a compelling and engaging CV is tough at the best of times. Let’s face it, writing about yourself in a balanced way that doesn’t seem arrogant or underselling yourself is a tough medium to find. If this is the case, websites, such as Purple CV, offer CV writing services, providing you with a good chance at securing your next interview. 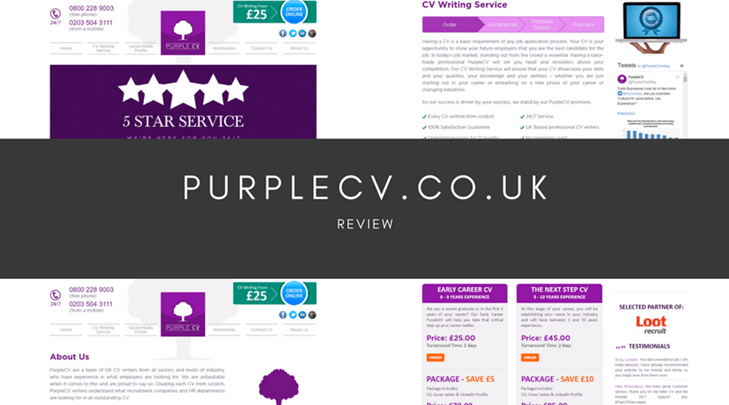 To begin, let’s take a look at what services PurpleCV has to offer. When it comes to CV writing, the provides you with four main services, depending on what level CV you want to be written, such as your first job, a second job or a complete career change. There also offer a range of additional services such as cover letter writing, express delivery and LinkedIn Profile writing. When using a custom resume writing service, you want a website you can trust. After thoroughly searching the website, it’s clear that there are signs of website security, great Trustpilot rating. This means when using the site, you can guarantee that malicious users, such as hackers, will be prevented from acquiring your personal and financial information. Also, there is a physical address which does boost accountability. The price depends on the package that you choose. The starter CV will set you back around £70 whereas the most advanced package is £175. This is extremely high, even for a resume writing service and may not be suitable for the majority of individuals budgets, especially those between jobs. You’ll also need to consider that all the accessories and express deadlines will cost you extra, meaning you could easily be spending more than £200. Referring to the testimonials page, you’ll find a long list of reviews about the site but no dates, package chosen or even a rating system. There is no doubt of the credibility and trustworthiness of the website. Searching online, I quickly discovered a range of reviews stating that the service was ‘okay’ and some people had resumes delivered slightly after the proposed deadline, but almost all of them got a refund. Customer support is what PurpleCV.co.uk excels in. There’s a live chat feature available on every page, a simple yet complete email form on the contact page as well providing you with toll-free phone numbers, an email address and links to the company’s social media pages, all of which is available 24-hours a day, seven days a week. However, please note that the refunds are only available if the work hasn’t already begun. Although excelling when it comes to customer support, Purple CV still lacks in certain essential areas. With added website security and proof, as well as a stricter adherence to deadlines and consistent quality, this could be a leading site. It’s recommended you take your business to them. If you’ve ever sat down and attempted to write a resume, you’ll already know how difficult it can be. Trying to include everything there is to know about yourself in an easily digestible format and the most interview-worthy way possible is no easy feat. To combat this growing concern, there is a tonne of resume writing services available to do it for you. 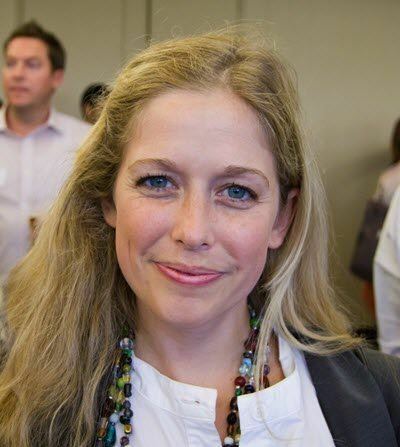 Today, I’ll be exploring the ins and outs of ResumeValley to see whether it’s right for you. ResumeValley.com only offers three limited services. This is an extremely poor selection services compared to some of the leading websites that cater for at least seven or eight key services. The services offered are a basic resume, a LinkedIn Profile and a CV. When it comes to company guarantees, the company states that it caters each resume it writes for the career you’re trying to enter and well as 24-hour support and personalized add-ons. The prices are relatively affordable. A basic resume will set you back just under $100 while a LinkedIn profile will set you back just under $70. However, the customisable add-ons, such as proofreading and fast speedy delivery will bump up the price considerably. At the footer of the page, you’ll find a series of accepted payment systems. However, there is no security certified or links to prove that these are legitimate. Referring to the reviews and testimonials page, you’ll know very basic reviews that lead me to doubt the credibility of the service. This is because there is no present ranking system for each review and it doesn’t tell you which service they invested in. What’s more, there’s no date on any of the reviews, meaning they could be decades old, if at all trustworthy. Searching online, I discovered mixed reviews stating that some resumes were delivered late while others haven’t heard from the company since they requested a refund. As you would expect from the guarantees of the service, you would expect 24-hour support. However, this only comes in the form of the basic live chat service. On the contact page, you’ll find an extremely basic email form with no dedicated email addresses depending on the nature of your query. There’s also a phone number located in the header of the page but this, again, handles all queries and there’s no dedicated line support for customers who have already paid. 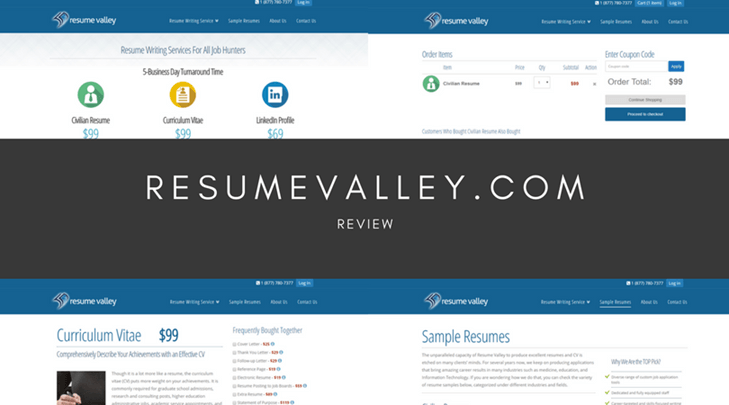 Despite the affordable prices, Resume Valley still a long way to go before it can be considered a leading resume writing service. 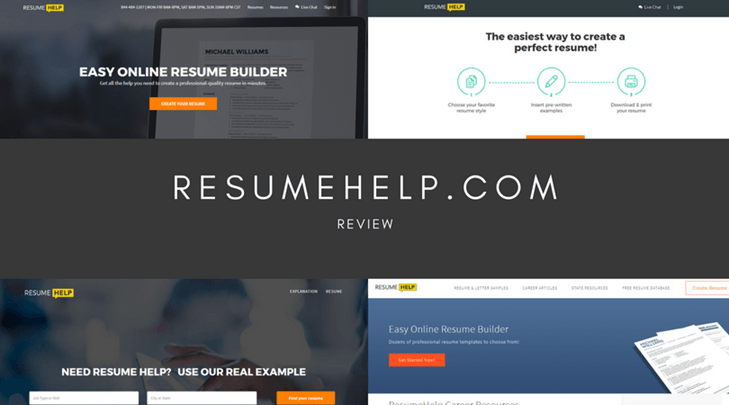 With un-comprehensive support methods, unverified payment systems that lead me to doubt the security of the website and mixed reviews on the quality of the work, I highly recommend taking your business to a more reputable resume writing service. When seeking out that perfect new job, the most daunting aspect of the job-hunting process is writing the dreaded resume. It’s important you don’t seem like you’re trying too hard and it’s vital that you don’t undersell yourself. It’s all about finding the right balance. To give you a helping hand, there are many resume writing services online to handle your requests. Today, we’ll be exploring Resume Professional Writers so you can see whether it’s the right service for you. Unlike many other resume writing services, this service only offers six various services. These include; resume and CV writing, federal resumes, LinkedIn profiles and job board posting. You can select your service based on four unique packages. Additionally, the website offers unlimited revisions of your writings, free future updates, free lifetime storage and a job interview guaranteed. As above, you have to select the package that you want. There are four to choose from, varying from a basic resume to the ultimate resume package. Within these packages, the deadline times and additional products vary. On average, you’ll be having to spend around $250. This is relatively expensive, especially when compared to the leading resume writing services. However, there is a complete lack of trust marks and verified payment certificates on the website, leading me to doubt the security of the undisclosed payment system. Referring to the testimonials page, you’ll find a collection of reviews for ‘past customers’. However, these reviews contain no rating system which again leads me to doubt the credibility of the website. Searching online, I discovered many of the past customers has mixed reviews. Some complained that their resumes were not high-quality as promised and did not award them an interview. When contacted the company, they are still waiting for their ‘free’ revision. Heading to the contact page, you’ll find four communication methods available, each with their own dedicated email form. There’s also a phone number (it’s not mentioned whether this is toll-free or not) and a live chat service. However, there is no physical address and no indication of whether the support service is 24/7. There are also social media links to pages that seem relatively inactive. Although the package system is unique in the resume writing industry and has potential, the prices are simply too high, and the quality is too inconsistent. The service needs to add a secure payment system or legitimate proof that they are operating one and until then, it’s highly advised that you steer clear. In the meantime, it’s highly recommended that you take your request to a more reputable website. Writing a resume is one of the hardest things to do. It’s not easy to write about yourself in a way that doesn’t seem like your bragging nor underselling yourself. However, a resume is essential for securing your next dream job. Several resume writing services are available online, claiming to be able your resume to the highest quality. 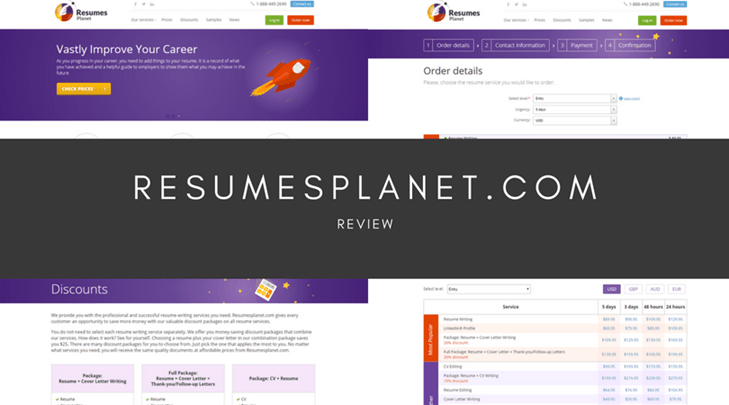 Resumes Planet is one of those services. On ResumesPlanet, you can choose from a selection of services. In addition to the regular CV and a resume writing and editing services, you can also have a LinkedIn profile written up on your behalf as well as a cover letter for your next application. The site promises to have your content written by an expert writer, delivered on-time as well as 24/7 support and free revisions of your content within 30 days. You can select from a variety of payment packages when using ResumesPlanet.com. You can pay for each service separately or choose from a full package option that will set you back around $130. This is fairly expensive for a resume writing service, even with the selected discounts on each service. You can pay using a variety of payment systems, although, none of these systems has verified trust badges, only embedded images of each system operator. Since there is no dedicated review or testimonials page on the website, this leads me to doubt the credibility of the website. Searching online, I quickly found that the service had mixed reviews. While others gave a shining 5-star review, others complained about poorly written content that seemed as though it had been rushed and contained errors that would have been discovered using a brief proofread. Other customers had also stated that the work was delivered after the proposed deadline. There are very limited support options available on ResumesPlanet. There’s a toll-free UK and US phone number, a support email address and an online live chat. However, there’s no email form for you to fill out and no links to the relatively inactive social media profiles. When using the live chat or email options, the site operates a ticket service, meaning the time it takes to get back to you can vary quite dramatically. Although the website has obviously been invested in quite considerable, there are many elements of the service that lead me to believe that the website is operating illegitimately. 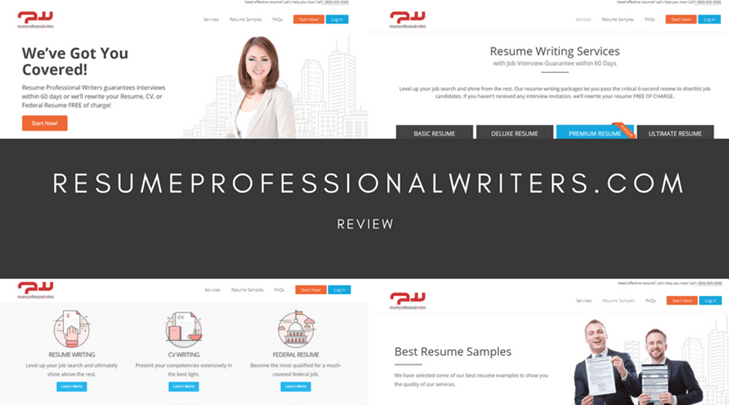 With no links to dedicated or verified payment systems and a complete absence of a review page (there are sparse, undetailed testimonials scattered around certain pages), I highly recommend taking your business to a more reputable resume writing service.